Thank you to all the handful of faithful followers of the blog. There is probably less than ten of you out there and your offers of help are deeply appreciated. Some truly amazing offers! The actual response to the “teaser” on U-tube and on the Paragon blog has been minimal in “number of hits”. Just not a lot of interest. That has been disappointing , but the film is 37 years old now (1975) and I guess that is to be expected. If I had my drruthers I would make a 45minute edited version of the original Paragons Paragon and shot a 45 minute sequel with the original actors. A script is already done. All the important players are still alive and well. It would be a unique movie and a fun convention film package. Actors years older struggling with age, and no make up needed. In order to do that I would buy a new computer along with sound and video editing programs and fix Paragon myself. Would I take a chance on re-mastering the original from the super 8 mm film? I am not sure? However the odds are against it turning out ok and favor the money going down the drain on a conversion that fails. Eliminating the original actors voices in Paragons Paragon, dubbing in new voices, and new sound track is not an option. It just would not be the same movie to me. I think 45 minutes of occasional hard to hear actors voices and a loss of humor scenes, and some of story line would be a better option than new voices. At least a good size chunk of the movie could be seen. The blog is in a “holding pattern”. I am flying around in circles not sure about what I might do with it. At the very least it has supplied material for interested parties about Paragons Paragon.That was its main purpose. IF YOU ARE A NEW PERSON TO THIS POST; go the end and then go forward from there. You will see mostly Star Trek “Paragons Paragon” material and how it evolved. IF YOU ARE A REGULAR VIEWER; tell me what you might want to know about or see. Other than the 1hr.20min. Paragons Paragon movie. OK, SO WHAT MIGHT STILL BE IN THE WORKS? I still want to make a 20 to 30 minute edited version available on the blog. When will it happen? I haven’t got the slightest idea. Just keep checking in every couple of months or so. I may have a third blooper already converted, but am not sure about it. NOT ENOUGH RESPONSE FOR THE VIDEO CLIP how to do it IDEA to pursue more of them. However any of my regular followers that want to have something posted, or articles that you want me to write about, all you have to do is ask. THE BEST THING FOR ME ABOUT THE BLOG has been meeting new friends and connecting with old ones. All of whom I will make a point of meeting in person soon. John, what are the technical risks with the old film? 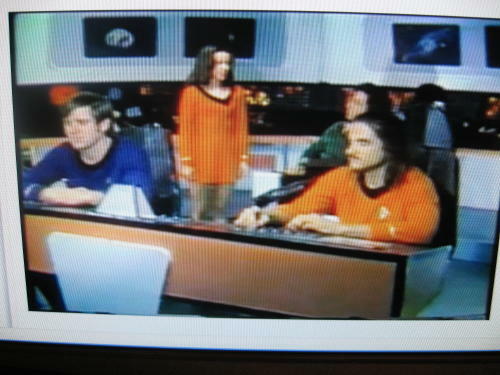 I wonder if Curt McAloney at startrekhistory.org could be of assistance. He’s a Hollywood film restoration pro whose current project is to restore and preserve original Star Treke film clips, singly or as footage. I email him from time to time. Let me know if you want me to reach out to him and ask. Questions are free of charge! Thanks for this blog, I’ve been really enjoying it. Is there perhaps a way you could crowdsource the funds you need to have the transfer done? Could Kickstarter or similar be used for something like this? I genuinely don’t know but I’m sure enough people would love to see the film! Hey John – I hope all is well – You’re still my favorite blog, even while in stationary orbit! It may be that there are expensive ways to salvage/restore the movie but there may be less expensive ways as well. I truly believe I can do a lot with your sound for nothing at all – I have a ton of sound equipment and software in my studio. And if you have or can locate a film projector, we can get it transfered digitally off a movie screen if necessary. It may not give you the $700 quality, but it may be surprisingly good with the advances in video cameras and especially editing and effects software (and I have some very good software and equipment…) Alternately, we could try to raise the money via indiegogo or less formally at the conventions I vend at. Let’s get in touch again soon and talk about it. I really want the complete movie to find it’s audience because I know they are out there and they are hungry for it, as am I! Take care! Hi John– I’m an acquaintance and fan of Tom Berdinski’s work. He asked me to come and take a look at your blog. Sounds (no pun intended) like your movie could use a soundover. If Tom says he can do it he can do it! Hope to see the finished product at some point in the future. One thing you may consider doing is taking the premise for Paragons Paragon and extending it or remaking it as a modern fan film. You can use the sets that are being finished for Star Trek Ajax. Of course, if you’re worried about money just to restore the old footage, you may not be in a position to do anything new. I would prefer making a sequel instead of a remake. I can’t find and preview footage for the Star Trek Ajax movie. Any suggestions? Thanks for the helpful suggestion about sets. Ajax is still in preproduction, but there have been articles written about it. The set (I think it’s just the bridge for now) is being built specifically to provide a free resource to any and all fan trek productions. This is a really sweet deal. A sequel to Paragons Paragon would of course not be feasible with the same cast, not unless you set it within the TOS movies, and that would not allow you to use the Ajax set, since it’s a TOS set. I just think, if you feel that you’ve mined whatever nostalgia-value there was to be had by documenting your old work for people on the internet, that the next step is to try something new, since in so many respects it’s easier these days. The reason I thought a remake might appeal to you is if you feel that you simply can’t present the old work in a way that satisfies your original internal vision, you could get a second crack at it now. I would think, though, that with the passage of time you do have something else to say that reflects your older, wiser perspective, rather than who you were and what mattered to you in the 1970s. Technology has not only made FX easier to do, it provides a way to remotely collaborate and gather knowledge that you didn’t have access to back then. To me, this is the most promising aspect. I currently have someone who is working on a CG model for my show–for free. And he lives in Brazil. This sort of thing was simply impossible before. Once you begin to really get keyed onto the possibilities, it becomes quite exciting. It’s not without its challenges, but using the full resources of the internet is the way to go. BTW, I also think a restoration project could be funded via Kickstarter. Right now Kickstarter is peaking and people are throwing money hand-over-fist at things. For instance, a documentary about Susan Oliver, the actress from The Cage, just got funding. I chipped in $45 and volunteered my animation services of my Orion slavegirl character if the guy wants it. If niche programming like that is able to get funded, something like your work surely has a shot at it. It really depends on how passionate you are to revisit the material and really invest a lot of your time and energy in it yet again. There’s another project out there that intends to do something similar going on right now which is Starship Yorktown, which is salvaging just the live-action material and completely redoing the FX and inserting new footage. And so it’s a very TOS Remastered sort of thing where it blends the old with the new, and that makes sense because it has established actors like George Takei in it. It’s a little harder to justify saving old 8 or 16mm footage of unknown amateur actors. It’s the very crudeness of the production and the anachronistic mutton-chops and poofy hair that kind of become the main appeal, not so much the storytelling. So you have to ask yourself whether the time-capsule aspect of it, as a historical document, is what matters to you most, or the Trek story you meant to tell is what matters. If it’s the story, of your unique take on the Trek mythos, then that is really not shackled to old footage that is costly to restore, and you can take it anywhere you want with modern digital cameras, editing, and FX. John, best of luck in whatever you decide. It has been great following your blog this past year or so. Bailey, whatever happened to the final act of Exeter anyway? I thought it was a first-rate effort and am disappointed that it was never completed. And I do hope John will return to film-making, even if not a Star Trek effort. Paragon, may also be the first Super-8 Feature film, if indeed there is an finished 80min cut. I would highly recommend transferring the original films to Digital. I can recommend Cinelab in MA, to have your film transferred to Hard Drive. There pricing is very reasonable and they can even Do a Hi-Def transfers of super8 if you like. They use a RANK Cintel machine that won’t hurt even the most fragile original films. Hopefully the original 8mm film is still in good shape. I’d be very interested to see this film in a completed form in any length. I’m currently considering making a 70ish scifi film, I plan to use NO CGI and lots of old school smoke and mirrors. I have saved this blog and will check back. I also saw THE ALIEN FACTOR when Cinematic Titanic was on Tour with it. Very neat effects! I’ve really been enjoying your website, John. Paragon’s Paragon is something special. I hope you go ahead and restore the film in some form. It would be fun to see a more complete version of it. Thank you for putting all of this material on the web. It’s fantastic! Been longing for this movie since the cinemagic article those many years ago. Just stopping by to say “hello”! THANK you for posting the film clips, and taking the time to produce this blog. Issues of film quality and so forth are irrelevant to what you and the Paragon team achieved. No less than today’s fan films, this was fan work at its finest. I attended a number of fan run conventions in the mid 1970s, but was never lucky enough to catch a “Paragon” screening. I wish you the very best of luck, and will certainly donate should you start a Kickstarter campaign. Paragon is a part of Trek and fan history alike, and deserves preservation. Thanks for appreciating a 39 year old project from the heart. It lead to The Alien Factor and great memories and friends. Havent had a computer fot , I thonk its been three years now. I miss it but its not an essential thing to me. The blog was fun to write and who knows some dsy there will be new old stuf added. Happy new year Jim. Thanks again for posting it all.